Born in Laurino in the first half of the sixth century (some say late eighth- or early ninth-century), Sant’Elena was a beautiful and pious maiden. Abused at home, she fled to the nearby mountains of Pruno to live the ascetic life of a hermit in solitude and prayer, and died there after 21 years. 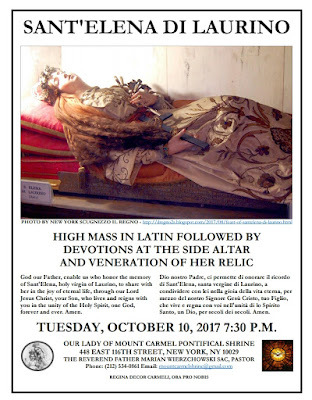 Her remains were discovered in the grotto and translated to the cathedral of Capaccio-Paestum; over the centuries, her relics were moved several times before finally being interred in the church of Santa Maria Maggiore in Laurino. According to legend, neighboring Valle dell’Angelo contested the ownership of the relics. To appease the rival claimants, it was decided her body would be put onto a cart driven by two heifers; when they reached a fork in the road leading to the two towns, they chose Laurino. 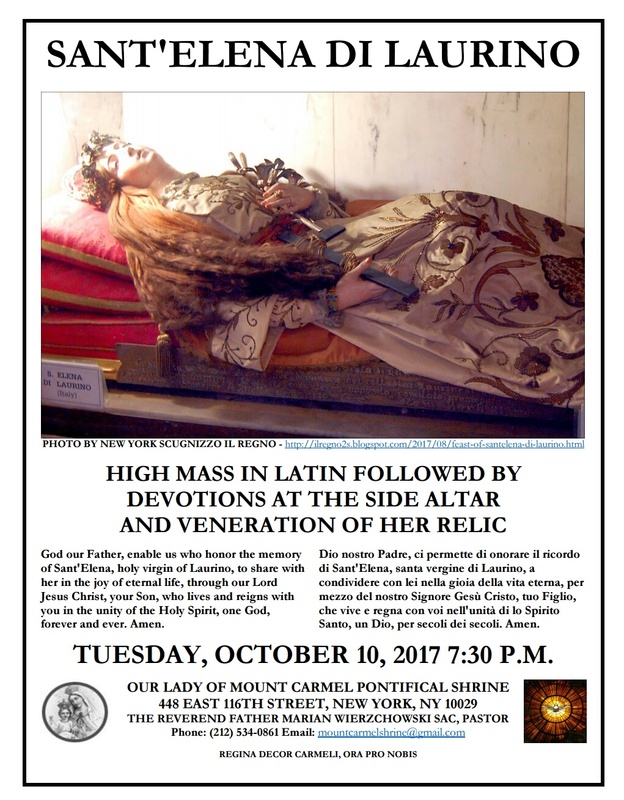 In 1923 Italian immigrants from Laurino in East Harlem created a replica of their hometown’s Shrine of Sant’Elena at Our Lady of Mount Carmel, and obtained a major relic of the Saint, which will be venerated after the Mass.